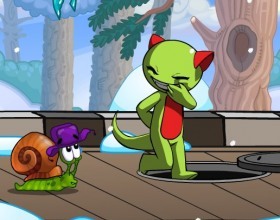 The latest and probably the biggest and the best part from toilet upgrade game Potty Racers. In this part you have to travel around the world, collect stars and upgrade your portable toilet. Use Arrow keys to hold your balance and drive. Press space to use boost. This is a Christmas edition of the Bow Master game. 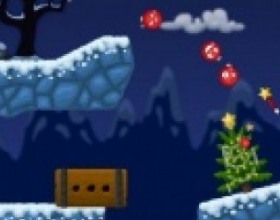 This time you have to hit Christmas trees, presents and other items related to Christmas target to complete the level. Use your mouse to aim, click to prepare, release to shoot. Santa is late for his Christmas work. Your task is to help him to get to his factory in 60 seconds. Move around using your Arrow keys. There are a lot of different platforms with different properties - check them all and get to the bus station as quick as possible. Christmas version of Gibbets game. 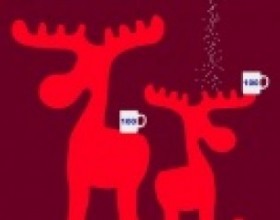 Santa and his friends are in big big trouble. Now you have to use your bow and arrows to cut the ropes or otherwise they all are going to die. Use your mouse to aim and shoot. 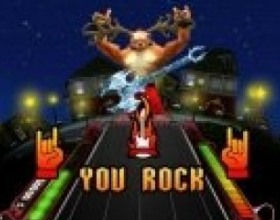 Collect bonuses and other items. Your task is to protect your Christmas gifts from attacking bitter toys. They all look so evil - not lovely like they used to. 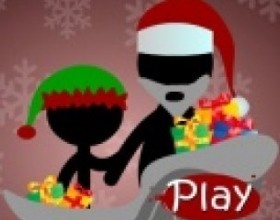 Open your presents early and you may find some good weapon to fight against enemies. Use mouse to attack them. 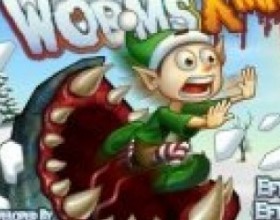 You have to control your giant earth worm and attack elves, rein deers, bigfoots, helicopters, and many more! 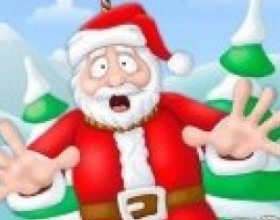 Eat them wave by wave, grow bigger, upgrade your abilities to scare the sh#t out of the Santa. Use W A S D to control your worm. 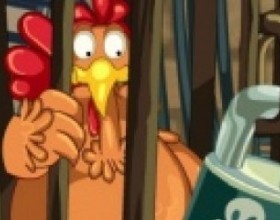 In this funny Thanksgiving day game your task is to help Turkey to escape from the chef. Run through the restaurant's kitchen and avoid any obstacles in your way. Use W S to move, press Space or K to jump. This is some new game from ClickDeath and Causality series. 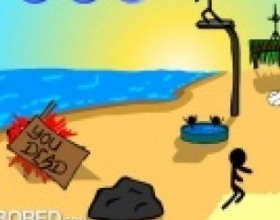 What could ruin a peaceful day at the beach? You know .. anything could happen. Your task is to take care about security for little stick men. Use your mouse to point and click. As usual in strategy defence games your task is to protect your base and kill all attacking enemies. 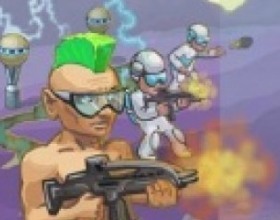 As game progresses new alien enemies and new weapons will appear. Use Mouse to control this RTS game. Your task is to shoot your toilet stone age man as high and far as you can. Earn money and buy cool upgrades. Use your mouse to click and launch. 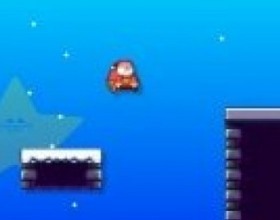 Use Arrow keys left and right or A D keys to balance your hero in the air. 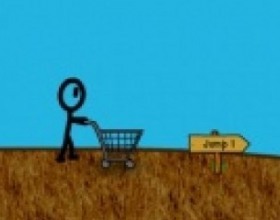 Shopping cart hero continue his adventures. As previously your task is to run down from the hill and fly with your stick dude in the shopping cart as far as you can. Earn money and buy cool upgrades. Use Arrow keys to control the game. Your task is to guide all Christmas decorations to the Christmas tree. 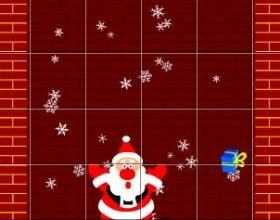 Just click on the gift boxes to open decorations and they will follow your mouse cursor. Avoid various obstacles on your way. Its Christmas-Stickmas time in Causality Land! 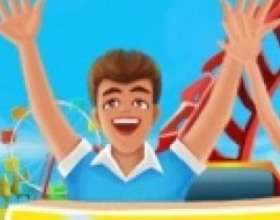 Your task is to perform various actions in the right order and kill all black guys to finish the game. Use your mouse to click on different places and cause chain reaction of actions. 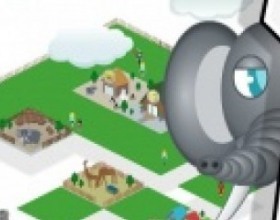 Are you ready to create your own zoo? Use your managing skills to earn money from your shops and houses. Each level has it's own goals you must reach. Use mouse to control the game and place buildings and make upgrades. Your task is to help Draka to turn all people into spiders. This creature hates Christmas. Spawn and cut your webs to get over various obstacles and reach humans! Then cut your web and attack your victim. Use Mouse to control the game. 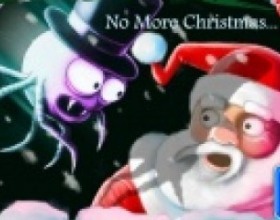 You know what to do - feed the monster or he will eat you instead of Christmas candy. 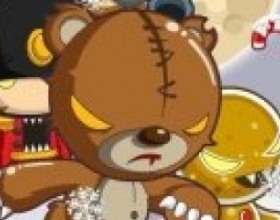 Replace blocks and use explosives to deliver candy to the monster. Use Mouse to control the game. 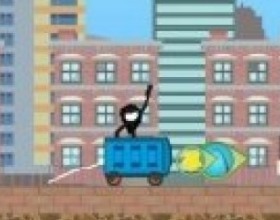 Our sticky candy addicted hero is back to swing and fly around the screen in order to catch as much candy as possible. Use Mouse to aim and extend your sticky arm to hold on surfaces. Sugar Sugar is great drawing game. As previous your task is to fill all cups full with sugar. Difference between original version is environment - It's Christmas :) Use Your mouse to draw lines and guide sugar drops into the cups. Are you ready to upgrade your toilet once again? 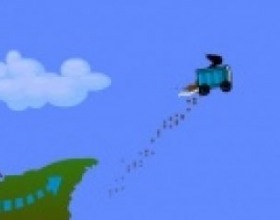 Convert your toilet cab into a flying machine and try to fly as far as you can. Use Right Arrow to start moving. Use Left and Right Arrows to balance. With Up and Down Arrows retract/deploy wheels. Press Space to use engine. As always use earned money on upgrades. Your goal is to construct your roller coaster and guide your customers from the start to the finish of your track. Use Mouse to select tools and draw coaster tracks. Collect as many gems as you can on your way. 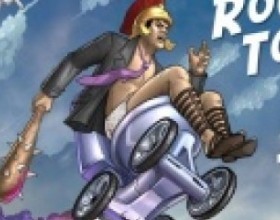 Your aim is to launch a guy on the toilet as far as possible to earn money for upgrades to launch him even further. You upgrade such things as engine, accelerator, wheels and other stuff. Use Mouse to aim, click when the pressure reaches maximal level to launch. 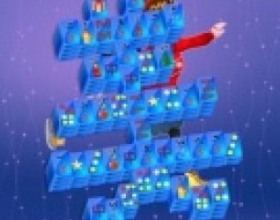 Your task in this Christmas Starlight edition is to find the right spot in the sky to make all stars stand at the right positions in order to create pictures. Move Mouse to see what happens with the stars. 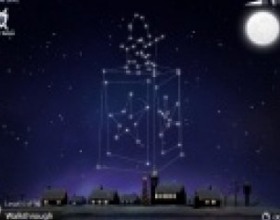 What else can be more pleasant for every workingman than anticipation of ensuing holidays? Holidays are an indispensable part of working life. These days enable people to rest and relax, distract from their everyday routine tasks. 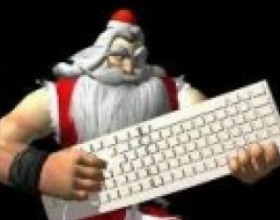 No wonder that there is nowadays a huge amount of computer games dedicated to the topic of holidays. 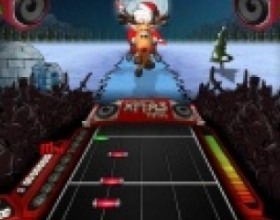 Many holiday games suggest that the gamer has to deal with various tasks concerning holidays. For example, he has to organize a holiday for a certain amount of guests, that is, he must plan, schedule, order food and presents, send inviting cards, etc. In other words, he must perform work usually performed when organizing holidays. Therefore, a very good practice is acquired and organizational skills, which can be very helpful in real life, are developed. 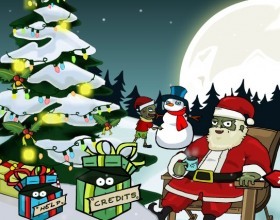 Another genre enables the player to celebrate different holidays in different countries. So these games are both educational and entertainment, as the player is going to find out which traditions and customs different nations are accustomed to while celebrating their holidays (religious, state, national, etc.). This genre can be quite useful for kids, as it gives them a nice opportunity to learn the cultural peculiarities and distinctions among various countries and acquire new and useful knowledge. 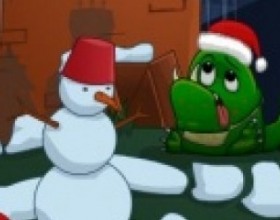 Some holiday games are adventurous. They suppose that during vacation the gamer is getting involved into series of various adventures. He is going to travel, meet new people, and try to get through extreme situations. It is like feeling yourself as a hero in a movie where everything is possible and the player can become a completely different person and experience exciting and absorbing emotions. Also, some holiday games include elements of joke games. Here, the player is becoming involved into various absurd and funny situations which he is not likely to deal with in everyday life. So, he must find out how to deal with these situations; usually these games are quite good-humoured. 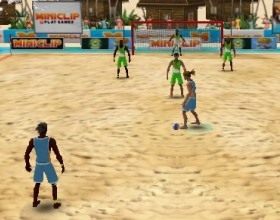 Holiday games are available online in vast quantities. Almost all of them are in 3D. They are perfectly suitable for everyone. It is absolutely amazing to play these games after a long and difficult working-day. Let yourself plunge into this absorbing world and have a nice rest before returning again to everyday routine.